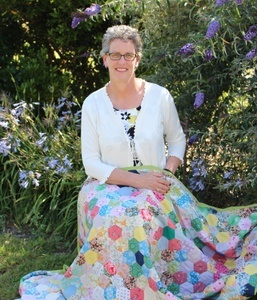 Gum Valley Patchwork is located in the countryside at 486 Princetown Road, Cooriemungle 3268 Victoria, Australia. It is 4 kilometres south of the township of Simpson, near the corner of the Cooriemungle Road (watch out for the pink flag). Local attractions situated close by are Sow & Piglets Brewery; Apostle Whey Cheese; and G.O.R.G.E Chocolates. Further south, the Great Ocean Road will lead you to the world famous Twelve Apostles, then past Loch Ard Gorge and on to Port Campbell. Gum Valley Patchwork is open Thursday, Friday, Saturday & Sundays from 11am til 4pm. Other times by appointment. Linda is the owner of Gum Valley Patchwork .